The Lady's reading-desk, fitted with hinged music book-rest and candle-tray, is festooned with Roman acanthus-husks and inlaid with a shell-scalloped medallion in the antique fashion popularised by Messrs A. Hepplewhite & Co. and relates to a Pembroke table pattern in The Cabinet-Maker and Upholsterer's Guide, London, 1788 (pl. 62). Such articles, it was claimed 'admit of considerable elegance in the workmanship and ornaments'. This pattern of flowered and patteraed handle was adopted in the late 1780s by the firm of Gillows of London and Lancaster. However its doors display golden tablets with flowered and hollowed corners after the French fashion adopted in the early 1770s by Thomas Chippendale (d. 1779) at houses such as Harewood House, Yorkshire (C. Gilbert The Life and Work of Thomas Chippendale, London, 1978, vol. II, fig. 96). 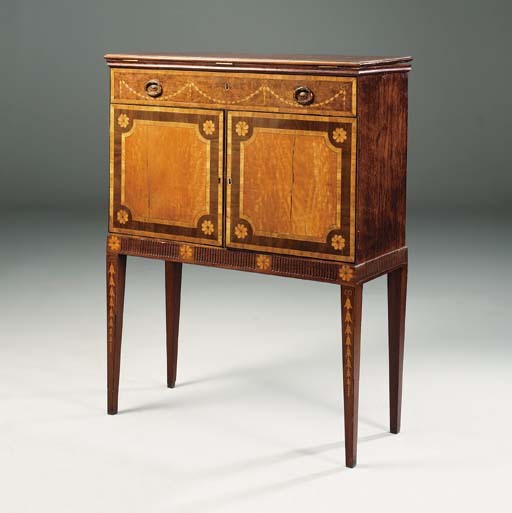 With its handles and scalloped medallion it relates in particular to a pair of commodes supplied by Gillows in 1788 for Arbury Hall, Warwickshire, (L. Boynton (ed. ), Gillow Furniture Designs 1760-1800, Royston, 1995, no. 121).